Hawaii's #1 mold removal & mold remediation service company! Ensuring that mold growth gets eliminated from your home isn’t just challenging, but it’s potentially dangerous work. That is why more homeowners recommend calling the experts at Rescue One Restoration to keep you and your family safe. Store-purchased products may merely mask the odor of mold, leaving it intact. When you need peace of mind that every spore is gone, you need to call us first before anyone else. Our team has over 32 years of remediation experience, giving you the best technicians for any situation. When you hire us, there’s never any doubt that your family will remain safe. Call us 24-hours every day for your best mold remediation service, or to receive a free quote. If you are concerned about possible mold growth in your home, we always get to the bottom of the problem. If you have visibly seen mold, or you have recently discovered a hidden leak somewhere, you may need us to protect you. Professional mold removal is the sole way to protect your family, employees, or customers from harm when they enter your building. Even if you’re not sure what the cause might be, we can understand your problem and offer the best solutions possible. We do our best to remove all odors and moisture, as well as growing mold spores that are keeping you ill. Whether you have a washing machine that backed up and flooded the room below, or you suffered through a significant storm, we can remove it all. Don’t hesitate another moment and call us for the best in local mold removal. Your first reaction may be to try and dry the mold out with fans. Although you do want the surface to dry, circulating air may wind up moving the spores further throughout the home. Even if it’s only been a day or two since you experienced water damage, the mold may already have begun growing. Call us right away as soon as you discover wall, ceiling, or floor damage from water. If you aren’t sure if an area has the potential to grow mold, your best bet is to call us anyways. It’s better to find out that you worried about nothing rather than ignored a severe problem. Homes that contain slow plumbing leaks or dripping fixtures, or homes that remain humid, are the most at-risk for mold growth. When you need a mold inspection completed right away, we are always available for you. If you spot areas of mold and you want to clean it now, use bleach and hot water only. General use cleaners are not capable enough to safely remove it. If your mold problem remains in just one room, keep the door closed to prevent further spread. Even if your home stays in relatively good shape, you may want to inform your insurance company regarding your findings. Finally, you’ll want to call our team for comprehensive mold remediation services. We also offer water damage restoration, home reconstruction services, contents pack-outs, and more restoration options. We remain a top choice in local home remediation services. Our team is fully licensed and insured, and we can protect you and your family from more types of damage. You might ask what the big deal is if you find a little mold growing in your home. However, for such a small issue, it can have lasting effects. Find mold restoration near me. Mold removal is more than identifying where mold is growing, but knowing what variety it is and ensuring that it gets eliminated. In some situations, structural concerns mean that some areas must be ripped down and rebuilt. Our cleaning process begins with a thorough assessment of your home to identify what we’re dealing with, as well as any affected areas you might not have noticed yet. Once our technician knows more, we can contain the issue and inform you of your best options. HEPA filters are the industry standard for cleaning mold, spores, and particles, ensuring they get removed without the fear of spreading them. Because mold is a living collection of spores, it develops ways of rooting itself to what is causing it to thrive. The safest way to prevent mold from returning is to dispose of anything that has been affected. After removing the problem, you may want to have your air ducts cleaned as well to prevent lingering spores from taking hold. We work with you to develop a moisture management plan, keeping future mold growth from occurring. Once the issue gets safely handled, you can move on to the reconstruction process. Finally, before we’re happy with the results, we’ll test your home for lingering moisture damage, odors, and visible mold growth. Mold has many causes, and after 32 years of remediation service experience, we’ve seen them all. The root of most mold issues is either hidden plumbing problems that have continued without your notice. Darker rooms and crawlspaces, especially in areas of higher humidity, may have trapped air that is ideal growing conditions. Or, if you recently had flood or storm damage, these areas may get even moister and at-risk. Exterior wall, siding, and roof cracks nearly always lead to water damage. 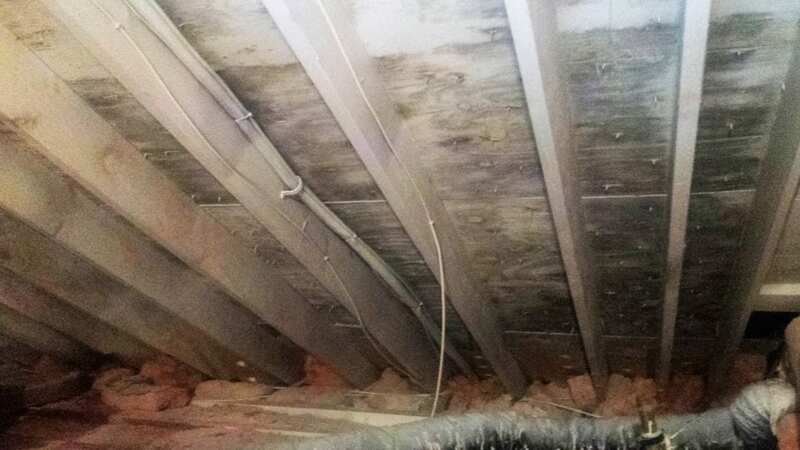 Where there is water damage, there is likely mold growth. Whatever the reason for your mold growth, Rescue One Restoration is still the best choice for your concerns. You can contact us 24-hours every day or schedule us online.